A site that covers many topics, but tends to focus on Apple. It is not often that Apple enters into a new accessory category of products, but it does happen from time to time. One area that people might not have expected Apple get into was the battery case market, but Apple did get into the market. They did so back in 2015. Back in December of 2015 Apple unveiled a brand new product specifically for the iPhone. At the time the iPhone was the iPhone 6s. They called it the “Smart Battery Case”. The Smart Battery Case would provide additional battery for the iPhone 6 or the iPhone 6s. The case came in two colors, Charcoal Gray and White. The case had a 1877 milliamp hour battery. This more than doubled the battery on the iPhone 6s. It would provide up to 25 hours of talk time, 18 hours of internets use on LTE, and up to 20 hours of video playback. With the release of the iPhone 7, Apple unveiled a version that would work with the iPhone 7. The case contained an even bigger battery, 2365 mAh, which is 26% bigger. With this bigger battery it provided even more usage, including up to 26 hours of talk time, up to 22 hours of internet usage on LTE, and up to 24 hours of playback. The iPhone 7 Smart Battery Case came in three colors; Black, White, and (PRODUCT)RED. 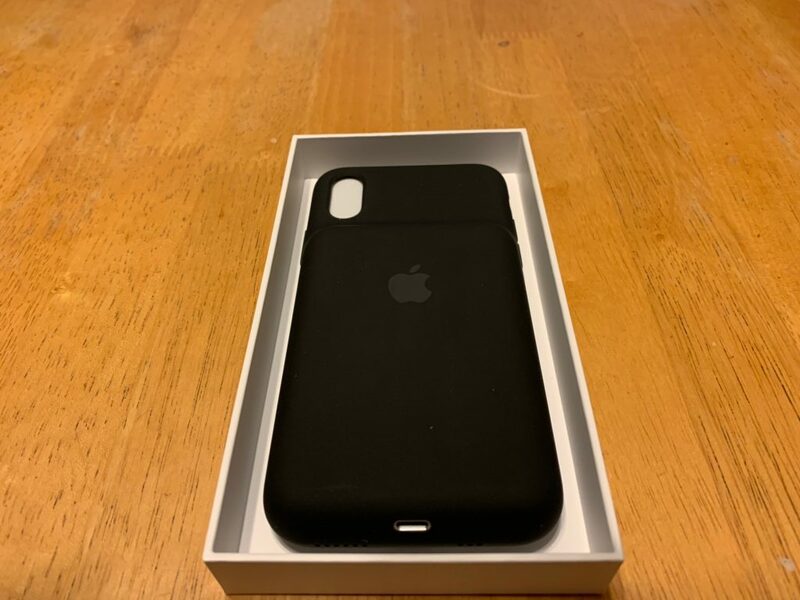 Apple did not release a smart battery case for the iPhone 8, nor have they released a smart battery case for any of the Plus-sized phones. Apple has released a Smart Battery Case for their latest iPhones. As mentioned in my post about the release, Apple has released some new Smart Battery Cases. Apple has done something a bit different. This year they released new Battery Cases for all of the iPhone models, the iPhone XS, iPhone XS Max, and iPhone XR. This is a first for the larger iPhone sizes getting a Smart Battery Case. When I received my case, it shipped with no charge. This is likely due to standalone battery shipping restrictions. First, they can only be shipped via ground shipping and are not eligible for shipping via air. The second reason that they ship without any charge is to reduce any fire hazard. The lack of charge means that you will need to charge the device before usage. This is different from most of Apple’s other devices, which usually ship with at least some charge in them. One of the features of the Smart Battery cases for this year’s phones is the fact that the case can be charged on a Qi charger. You might expect that if the case is charging the iPhone would not be. This is not the way the Smart Battery Case is designed. It can in fact charge both the iPhone charges simultaneously with the case. If you have a Qi charger and it can support fast charging, which is 7.5 watts. The Smart Battery Case is capable of handling fast charging. The order of which items charges first depends on how much power you provide the case and iPhone. If you use the 5-watt charger that comes with the iPhone it will likely charge the iPhone and may not end up charging the case. If you increase this to 7.5-watts, the iPhone will be be charged first and then the Smart Battery Case. If you use a 10-watt or higher charger then both of the devices should charge simultaneously. The Smart Battery Case feels very similar to the iPhone Silicone case. The Smart Battery Case is made of the same material so this is to be expected. The interior of the Smart Battery Case is a soft microfiber lining. This is designed to help protect the back of the iPhone from scratching. The design of the Smart Battery Case has been tweaked from the previous ones for the iPhone 7 and iPhone 6/6s. On the previous models the battery was approximately in the middle of the case with an equal amount of space on the top and bottom. The iPhone XS Smart Battery Case has the battery at the bottom. The edges of the battery at the bottom are rounded and the round edges also extend to both sides of the case. The top of the battery extends to between the volume buttons. This is where the hinge of the case is. The hinge allows you to put the phone into the case as well as remove it when necessary. I am not sure how many times the hinge can be pulled back before it breaks, and I am not about to test it to find out. With the new rounded design. the Smart Battery Case is great to hold. The Smart Battery Case does add some weight, and one might expect, given that it contains a battery. 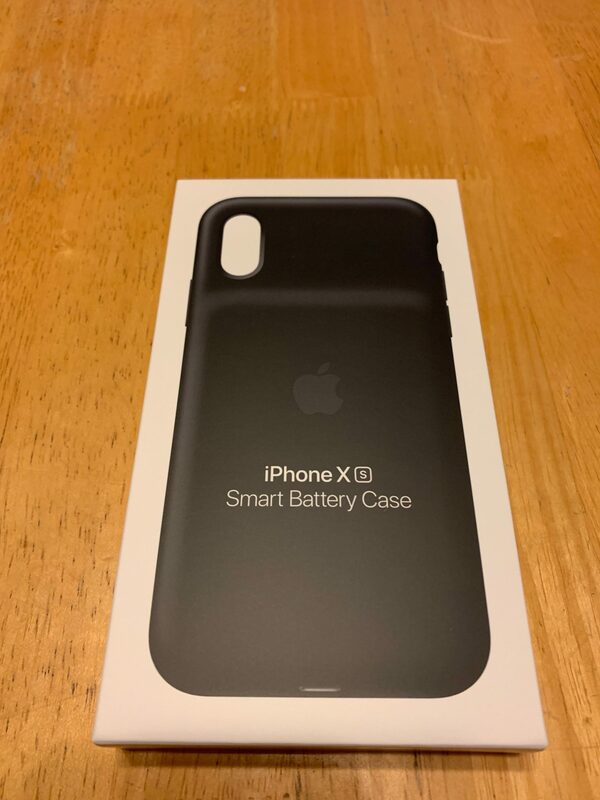 When you connect the Smart Battery Case to an iPhone, the iPhone will show both the iPhone’s battery as well the Smart Battery Case’s current level right on the notification screen. Just as with other accessories, if either the Smart Battery Case or the iPhone is currently charging, it will have a small lightning bolt next to the device to indicate that it is charging. After I put my iPhone XS into the Smart Battery Case. I noticed that the iPhone is constantly be charged. At least that is what I have noticed during my usage of the case. The specifications indicate that you will get up to an additional 13 hours of talk time, an additional 7 hours of internet usage, or an additional 11 hours of Video playback with the Smart Battery Case. I cannot verify this information as I generally do not let my iPhone or the case get that low. I did let the battery pack get close to zero, but never all the way down to zero. I have yet to remove the Smart Battery Case from my iPhone XS except to remove some dust from the top of the screen. I am not sure if I really even need the battery case, but having it on there may come in handy if I am away from a charger for more than 24 hours. The Smart Battery Case from Apple will definitely allow your iPhone to last longer. While it is not an inexpensive item, nor is it for everyone, if you are one who could benefit from the use of a battery case, it may be a worthwhile investment. The iPhone XS Smart Battery Case is possible solution. While it does add bulk, it does not feel awkward to hold. I do not yet know if I will end up keeping the case on the iPhone XS when spring and summer come around. Right now keeping it in a hoodie or coat pocket is not a big problem right now. I can only speculate how well it will work in the summer, but I guess we will find out. The Smart Battery Cases for the iPhone XS, iPhone XS Max, and iPhone XR are available now for $129.